Very light street footbike model with a 16” front wheel and a 12” rear wheel. Kids edition is also available. Rebel is a perfect Last-Mile-Transport and it should become a regular part of your car's equipment. Premium version footbike for kids - Your children will be delighted with their new scooter. Small city footbike with front and rear 16” wheels. Perfect for trips and city rides. The footbike has been designed for quick direction change. Smaller footbike with 20” front wheel and 16” rear wheel. Suitable for shorter cycleway tours, mild terrain rides and city travels. This footbike grows with the rider - from childhood to adulthood. Perfect for the whole family. The model with two 20” wheels. 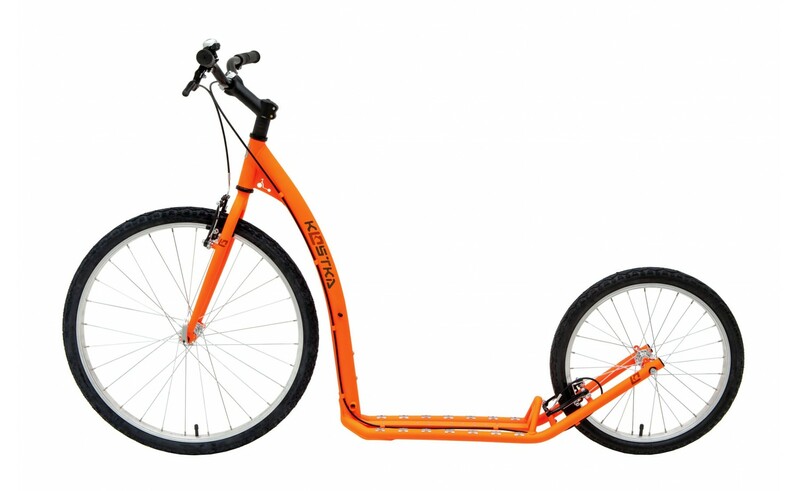 Mid-size quick model for both shorter and longer trips on asphalt, unpaved roads and cycleways. Both 20” wheels allow a perfect, comfortable ride, even when the footbike moves quickly. Adult footbike for longer trips on asphalt and various terrain types. The combination of the 26” front wheel and the 20” rear wheel makes this footbike a perfect adult model for quick and still comfortable ride on any terrain. Big-size model with a 28” front wheel and a 24” rear wheel for challenging the longest trips and tourist expeditions. Allows a comfortable ride not only on asphalt but also on rough tiles or forest paths. Equip your footbike with bags, take a sleeping bag and a camping mat and let’s go for an adventure. The Racer model excel primarily on asphalt roads. If you plan to win a race or if you just want to ride like a devil and break the (time and speed) records, then the Racer is the best choice for you! Racing and sports models. Footbike on huge 4" fat tires. This model is more controllable apart from its bigger brother MONSTER. Raptor is destined for downhill, mushing and pure adrenaline on any type of surface. It is also suitable for lower figures or mushers juniors. A monstrous footbike with 4” fat tires, special hub with a 12mm solid axle, reinforced frame and a sturdy rear construction and a broad deck. Perfect model for downhill racing, dog walking and experiments on unpaved terrain. Basic footbike model with a 20” front wheel and a 12” rear wheel - for shorter trips and travels through the city. The footbike has an extended rear construction - it also serves as a mudguard with an integrated rear light.